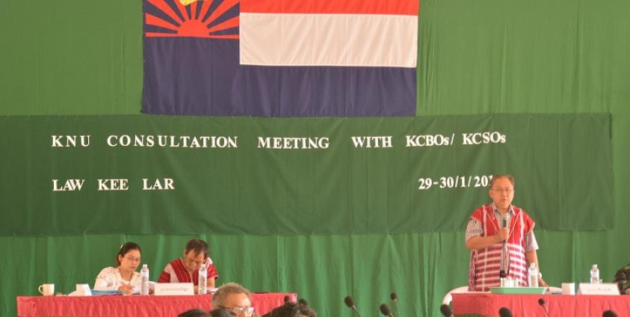 The Karen National Union (KNU) Central held a consultative meeting with Karen community-based organizations (CBOs) and civil society organizations at the KNU-controlled area in Law Khee Lar on January 29-30 to explain the current peace process and political dialogues carried out by the KNU. The KNU’s joint secretary P’doh Saw Hla Tun told Karen News that the two-day meeting aimed to cooperate in carrying out the work programs, which are based on current political situation and KNU’s political standpoint. “According to the future plan set down by the KNU, such kind of meetings must be held with Karen CSOs and Karen parties for the peace process and political dialogues,” he said. The consultative meeting comprised a discussion on the current peace implementation and views and suggestions concerning the Union Peace Dialogue Joint Committee (UPDJC), the national-level political dialogue, CSOs Forum, the Joint Ceasefire Monitoring Committee (JMC), and the Union Peace Conference (UPC). “We want the voice of the entire Karen people and our needs to be included in the third session of the 21st Century Panglong [Conference] without any weaknesses. That’s why we are attending this meeting despite our busy schedule. This is the Karen history and it’s for creating a good future. Respective elders supported this. This is a big opportunity,” said Saw Ho Shay from the Mon State Central Literature and Culture Committee. A total of 145 people from 44 organizations including the KNU’s Central Committee, department representatives, Karen CBOs, and Karen CSOs attended the meeting.